Initial support for RDS has just been added to boto. The code currently lives in the subversion trunk but a new boto release will be out very soon that will also include the new RDS module. To get things started, I'll give a short tutorial on using RDS. Because the Parameters have information about the type of the data and allowable ranges, we can do a pretty good job of validating values before sending them back to RDS with the apply method. Now that we have a DBSecurityGroup and DBParameterGroup created, we can create our DBInstance. So, at this point our new DBInstance is up and running and we have the endpoint and port number we need to connect to it. One of the nice things about RDS is that once the instance is running, I can use RDS to perform a lot of the management tasks associated with the server. I can do snapshots of the server at any time, or I can automate that process. I can change any of the parameters associated with the server and decide whether I want those changes to take place immediately or to wait until the next maintenance window. I can also use the modify_dbinstance method to tell RDS to increase the allocated storage on my server or even move my instance up to a larger instance class. The current RDS code is checked in. It's still beta quality but we will be releasing a 1.9 version of boto early next week which will include this code as well as support for VPC and a ton of bug fixes. So, if you get a chance, give the boto RDS module a try and let us know what you think. RDS: The End of SimpleDB? The recent announcement of Amazon's Relational Database Service is generating a lot of buzz. And well it should. For people who require a relational database for their applications and have been rolling their own with EC2 and EBS, it offers a really nice option. Let AWS manage that database for you and focus more attention on your app. It also represents another inevitable step up the ladder from IaaS to PaaS for AWS and gives pretty good triangulation data about where cloud computing will be in a few years. But does RDS also mean the end of SimpleDB? There have already been posts on the SimpleDB forum to that affect. I think the answer is "no" but it does illustrate what I think has been a misstep in the evolution of SimpleDB. Let me start by saying that I love SimpleDB. I use it all the time. I have built a number of real applications and services with it and in my experience it "just works". I know there are some applications that just require a full-blown relational database but in my experience I've been able to do everything I need to do with SimpleDB. And I absolutely love the fact that it's just there as a service, doing whatever it needs to do to scale along with my app. But it seems like SimpleDB has always been a bit of a red-headed stepchild at AWS. They haven't had a clear, consistent strategy for it. When people compared it to a relational database, rather than following the NoSQL philosophy they tried to make SimpleDB look more like a relational database. They deprecated it's elegant set-based query language with a SQL subset in hopes of attracting the relational crowd. But I think mainly what happens is that people focus on the "subset" aspect and are always pining for yet more SQL compatibility. I just don't think it won them many converts. So, does RDS represent the end of SimpleDB? I really don't think so. The two offerings are very, very different. AWS needs to embrace that difference and communicate it more clearly. There are a lot of applications out there that can benefit from the lightweight, super-scalable, and easy to use qualities of SimpleDB. MySQL simply can't compete on those dimensions. I'm pretty sure AWS agrees but it would be nice to see some positive reinforcement from them soon, before their user base get's scared. I don't think that building RDS on the back of SimpleDB is what AWS had in mind. The first part of this series described the various AWS credentials and the second part focused on some of the challenges in keeping those credentials secret. In this short update, I want to talk about a new feature available in AWS that will help you keep your credentials more secure. The new Multi Factor Authentication (MFA) provides an additional layer of protection around access to your AWS Console and AWS Portal. As you recall from Part 1, controlling access to these areas is vitally important because they in turn allow access to all of your other AWS resources and credentials. Once you have the device and are registered for MFA, when you attempt to log in to your AWS Portal or AWS Console, you will be asked for the email address associated with the account, the (hopefully very strong) password associated with the account and then finally you will be asked to enter the 6-digit number that appears on your device when you press the little grey button. That means that even if someone discovers your password, they still need the device before they can log in. And, even if they have the device, they still need your password. Hence the name, Multi-Factor. The devices are inexpensive and the additional security they provide for your AWS credentials is well worth the cost. I highly recommend MFA. At least for your production credentials. Another useful new security capability is Key Rotation. This is automatically enabled for all AWS accounts and allows you to create a new AccessKeyID and SecretAccessKey but allow the old ones to remain active. In that way, you can create new keys and then begin transitioning your servers to use the new credentials and when the transition is complete, you can then disable the old credentials. That's handy anytime you think you may have been compromised but its also a good idea to do it as part of a regular security routine. Years ago, when I was working on DocuShare at Xerox, I used to set aside an hour or two once a week and, in the tradition of David Letterman's Stupid Pet Tricks, I used to come up with a Stupid DocuShare Trick and email it around to colleagues. The rules were simple. It was actually quite fun and a couple of the tricks eventually evolved into truly useful features. So, I thought I would start something similar with boto. The inspiration behind this Stupid Boto Trick was a thread on the SimpleDB forum. A user asked whether it was possible to get a listing of all SimpleDB domains across all AWS regions. The answer is "no" or at least "no, not directly". Each region has it's own set of service endpoints and you have to connect to a specific endpoint to issue requests. So, you would have to ask each SimpleDB endpoint for a list of domains and then combine the two lists on the client side. To address this, I created a new Python class called a ServiceSet. A ServiceSet represents all of the endpoints for a particular Service and, when you access a particular attribute or method on the ServerSet, it actually performs the action on each of the endpoints of the service and then assembles the results for you. Here's the quick, dirty, undocumented code. Hey, like I said, I only get an hour at the most! The results are returned as a list of lists although a slight modification to the ServerSet code would allow for a concatenated set. The nice thing is that the Domain objects within each of the lists knows about it's SDBConnection and will therefore always route Domain-specific methods to the right endpoint. So, there we have it. The first Stupid Boto Trick. I've created a Mercurial repo on bitbucket.org just to collect these tricks. You can access it at http://bitbucket.org/mitch/stupidbototricks/. You also need to be running at least r1306 of boto. Back in the early, halcyon days of Cloud Computing there was really only one game in town; Amazon Web Services. Whether by luck or cunning, Amazon got a big, hairy head start on everyone else and so if you wanted Cloud-based storage, queues or computation you used AWS and life was, well, simple. But now that we clearly have a full-blown trend on our hands there are more choices. The good folks from Rackspace picked up on the whole Cloud-thing early on and have leveraged their expertise in more traditional colo and managed servers to bring some very compelling offerings to market. Google, after their initial knee-jerk reaction of trying to give everything away has decided that what they have might be worth paying for and is actually charging people. And Microsoft, always a late riser, has finally rubbed the sleep dirt out of their eyes and finished their second cup of coffee and is getting serious about this cloud stuff. It's clear that this is going to be a big market and there will be lots of competitors. So, we have choices. Which is good. But it also makes things more complicated. Several efforts are now under way to bring simplicity back in the form of unifying API's or REST interfaces that promise a Rosetta stone-like ability to let your applications speak to all of the different services out there without having to learn all of those different dialects. Sounds good, right? And that's just one offering from one company. It's clear that we have not yet fully identified the complete taxonomy of Cloud Computing. Trying to identify a unifying abstraction layer on top of this rapidly shifting sand is an exercise in futility. But even if we look at an area within this world that seems simpler and more mature, e.g. storage, the task of simplifying is actually still quite complex. As an exercise, let's compare two quite similar services; S3 from AWS and Cloud Files from Rackspace. S3 has buckets and keys. Cloud Files has containers and objects. Both services support objects up to 5GB in size. So far, so good. S3, however, has a fairly robust ACL mechanism that allows you to grant certain permissions to certain users or groups. At the moment, Cloud Files does not support ACL's. Even more interesting is that when you perform a GET on a container in Cloud Files, the response includes the content-type for each object within the container. However, when you perform a GET on a bucket in S3, the response does not contain the content-type of each key. You need to do a GET on the key itself to get this type of meta data. So, if you are designing an API to unify these two similar services you will face some challenges and will probably end up with a least common denominator approach. 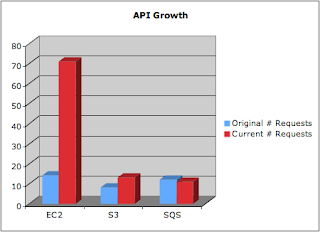 As a user of the unifying API, you will also face challenges. Should I rely on the least common denominator capabilities or should I actually leverage the full capabilities of the underlying service? Should the API hide differences in implementations (e.g. the content-type mentioned above) even if it creates inefficiencies? Or should it expose those differences and let the developer decide? But if it does that, how is it really helping? I understand the motivation behind most of the unification efforts. People are worried about lock-in. And there are precedents within the technology world where unifying API's have been genuinely useful, e.g. JDBC, LDAP, etc. The difference is, I think, timing. The underlying technologies were mature and lots of sorting out had already occurred in the industry. We are not yet at that point in this technology cycle and I think these unification efforts are premature and will prove largely ineffective. The AWS juggernaut continues. In the wee hours of the morning, a new Shared Snapshot feature was announced. This handy new feature allows you to share EBS snapshots in the same way you can share an AMI already. So, I can now give any other AWS user the permission to create a new EBS volume from one of my existing EBS snaphots. And, just as I can make one of my AMI's public (allowing anyone to launch it) I can also choose to make one of my EBS snapshots public, allowing any AWS user to create a volume from it. Jeff Barr's blog entry described some use cases for this new capability and Shlomo Swidler provides quite a few more. Just the ability to share EBS volumes across dev/test/production makes this a killer feature for me but there are many, many more use cases. The first step, though, is to add support for the new features in boto and I'm pleased to announce that as of r1298 the latest subversion code does just that. I'll be packaging up a new release soon, but until then I encourage you to give the subversion HEAD a try. That should be enough to get you started. The API documentation has been updated although a few more updates are needed. BTW, if you haven't checked out the online docs recently you should. Patrick Altman converted all of the existing docs over to use Sphinx and the results are very, very nice. Thanks, Patrick. One of the main goals of the boto project is to support all Amazon services and to keep that support current as AWS releases new versions of the services. As the number of services grow, and the pace of development at AWS increases, that becomes a challenge: at some point I will simply be unable to keep up! To meet that challenge, I would like to solicit help from the boto community. You could take responsibility for an existing boto module. This would mean addressing issues in the module as well as improving the module. In particular, boto 2.0 will be a major upgrade and may involve significant, even incompatible, changes in existing modules. As the owner of a module, you would be responsible for proposing changes, responding to comments, building consensus and ultimately implementing the changes. In practice, I think that a prerequisite for taking ownership of a module would be that you are a heavy user of the module. You could express interest in developing new boto modules. We have a strong relationship with AWS and are usually briefed on upcoming services prior to their public announcement. Participating in AWS private alphas and betas is a fun experience and gives you direct input into the services and API's. Participating in this way would require you to sign, and more importantly, to honor a very strict confidentiality agreement with AWS. We can help facilitate this process with AWS. In addition to these two scenarios, I'm also interested in establish a community of core developers and contributors to boto. As I mentioned before, the 2.0 release will be a major release and everything is on the table. I have a lot of ideas involving refactoring of existing code and also support for services beyond AWS. I would love to get more feedback and more ideas from the community around this release. If you are interested in getting more involved in boto, please contact me directly; mitch.garnaat at gmail dot com. A new version of boto is available. Version 1.8c fixes a serious issue in the S3 module and two Unicode-related issues in the mturk module. I recommend all boto users who were running 1.8a or 1.8b upgrade to 1.8c asap. Released support for CloudWatch, Elastic Load Balancer (ELB) and AutoScale services. Thanks to Reza Lotun for contributing the AutoScale service module! Support for POST on SimpleDB BatchPutAttributes requests and EC2 RunInstances requests. Both of these requests allow more data than can fit in a GET request. Supporting POST for these requests eliminates the restrictions of GET. Thanks to Andrey Smirnov and Brett Taylor from AWS for providing details on the use of POST in Query API's. A number of changes to further support the use of boto with Eucalyptus. Thanks to Neil Soman for his help and patience in remote debugging these changes. The new version can be downloaded from the Google Code Project Site. That certainly isn't a comprehensive list but you can find plenty of information on securing servers and fortunately, since the servers you are running in the EC2 environment are standard servers, all of that information can be applied directly to securing your instances in AWS. In fact, some of the tools provided by AWS such as the distributed firewall in EC2 can actually make the process even more secure because everything can be controlled via API's. So, for example, you can shut down SSH traffic completely at the EC2 firewall and write scripts that automatically enable SSH access for your current IP and then shut that port down as soon as you have closed your SSH session with the instance. This series of articles focuses on an aspect of security that is very specific to AWS: managing your AWS credentials. In this first installment, let's start by reviewing the various credentials associated with your AWS account because this can be confusing for new users (and sometimes even for old users!). These are the credentials you use to log into the AWS web portal and the AWS Management Console. This consists of an email address and a password. Since these credentials control access to all of the other credentials discussed below, it is very important to choose a strong password for this account and to age the password aggressively. I recommend using a service like random.org to generate 10-12 character random strings (longer is even better). Securing access to the portal should be your primary security goal. The Account Number is a public identifier and is used mainly for sharing resources within AWS. For example, if I create a AMI in EC2 and I want to share that AMI with a specific user without making the AMI public, I would need to add that user's Account Number to the list of user id's associated with the AMI (see this for details). One source of confusion here is that even though the Account Number is displayed with hyphens separating the three groups of four digits, when used via the API the hyphens must be removed. Once you are logged into the AWS portal, you will see a page titled "Access Identifiers". There are really two types of Access Identifiers. These Access Identifiers are at the heart of all API access in AWS. Virtually every REST or Query API request made to every AWS service requires you to pass your AccessKeyID as part of the request to identify who you are. Then, to prove that you really are who you say you are, the API's also require to you compute and include a Signature in the request. The Signature is calculated by concatenating a number of elements of the request (e.g. timestamp, request name, parameters, etc.) into a StringToSign and then creating a Signature by computing an HMAC of the StringToSign using your SecretAccessKey as the key (see this for more details on request signing). When the request is received by AWS, the service concatenates the same StringToSign and then computes the HMAC based on the SecretAccessKey AWS has associated with the AccessKeyID sent in the request. If they match, the request is authenticated. If not, it is rejected. The AccessKeyID associated with an account cannot be changed but the SecretAccessKey can be regenerated at any time using the AWS portal. 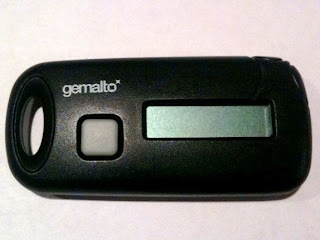 Because the SecretAccessKey is the shared secret upon which the entire authentication mechanism is based, if there is any risk that your SecretAccessKey has been compromised you should regenerate it. In fact, it would be a good practice to age your SecretAccessKey in the same way you do the password in your AWS credentials. Just remember that once you change the SecretAccessKey, any applications that are making API calls will cease to function until their associated credentials are updated. The other Access Identifier associated with your account is the X.509 Certificate. You can provide your own certificate or you can have AWS generate a certificate for you. This certificate can be used for authenticating requests when using the SOAP versions of the AWS API's and it is also used when creating your own AMI's in EC2. Essentially, the files that are created when bundling an AMI are cryptographically signed using the X.509 cert associated with your account so if anyone were to try to tamper with the bundled AMI, the signature would be broken and easily detected. When using the SOAP API's, the X.509 certificate is as critically important from a security point of view as the SecretAccessKey discussed above and should be managed just as carefully. Remember, even if you don't use SOAP, a hacker could! The final credential we need to discuss is the public/private keypair used for SSH access to an EC2 instance. By default, an EC2 instance will allow SSH access only by PublicKey authentication. I strongly recommend that you stick to this policy in any AMI's that you create for your own use. SSH keypairs can be generated via the AWS Console and API. You should create keypairs for each individual in your organization that will need access to running instances and guard those SSH keys carefully. In fact, what I recommend is storing all of these critical credentials in an encrypted form on a USB memory stick and only on that device (and a backup copy of it to be safe, of course). You can either use a device that incorporates the encryption natively (e.g. IronKey, etc.) or you can create an encrypted disk image and store that on the USB device. Alternatively, you could just store the encrypted disk image itself on your laptop but never store these critical credentials in the clear on any computer or memory stick and definitely do not email them around or exchange them via IM, etc. In Part 2 of this series (coming tomorrow! ), I'll discuss a strategy for managing these important credentials in a production environment. Stay tuned! The new CloudWatch service from AWS provides some interesting ways to monitor EC2 instances and LoadBalancers. The code to support this new service has just been checked into the subversion repository for boto. It still needs some hardening before it will be incorporated into a new boto release but if you are interested in experimenting with CloudWatch, check out the latest boto code and let me know what you think. This post should provide just about enough to get you started. The list_metrics call will return a list of all of the available metrics that you can query against. Each entry in the list is a Metric object. As you can see from the list above, some of the metrics are generic metrics and some have Dimensions associated with them (e.g. InstanceType=m1.small). The Dimension can be used to refine your query. So, for example, I could query the metric Metric:CPUUtilization which would create the desired statistic by aggregating cpu utilization data across all sources of information available or I could refine that by querying the metric Metric:CPUUtilization(InstanceId,i-e573e68c) which would use only the data associated with the instance identified by the instance ID i-e573e68c. Because for this example, I'm only monitoring a single instance, the set of metrics available to me are fairly limited. If I was monitoring many instances, using many different instance types and AMI's and also several load balancers, the list of available metrics would grow considerably. Once you have the list of available metrics, you can actually query the CloudWatch system for the data associated with that metric. Let's choose the CPU utilization metric for our instance. Our period was 60 seconds and our duration was one hour so we should get 60 data points back and we can see that we did. Each element in the datapoints list is a DataPoint object which is a simple subclass of a Python dict object. Each Datapoint object contains all of the information available about that particular data point. My server obviously isn't very busy right now! That gives you a quick look at the CloudWatch service and how to access the service in boto. These features are still under development and feedback is welcome so give it a try and let me know what you think. With apologies to Abraham Maslow and his hierarchy of human needs, a somewhat tongue-in-cheek variation applied to the brave new world of Cloud Computing. 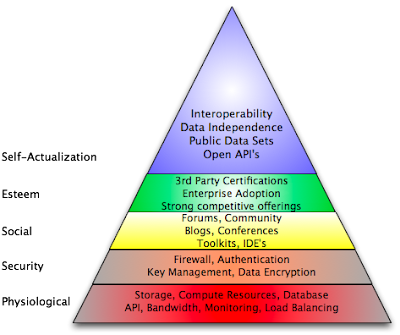 Cloud Computing Hierarchy of Needs by Mitch Garnaat is licensed under a Creative Commons Attribution-Share Alike 3.0 United States License.